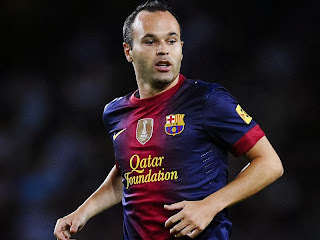 Andrés Iniesta Luján (born 11 May 1984) is a Spanish footballer who plays as a central midfielder for La Liga club FC Barcelona and the Spanish national team. Iniesta came through La Masia, the Barcelona youth academy after an early emigration from his birthplace and impressed from an early age. He made his first-team debut in 2002, aged 18. He began playing regularly during the 2004-05 season, and has remained in the side ever since. 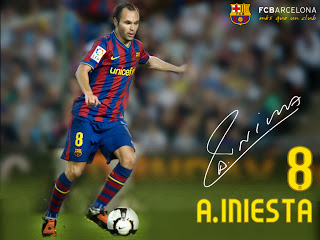 He was an integral part of the Barcelona side in 2009, the only time which a club has achieved six titles in one season. He is considered to be one of the greatest midfielders of all time, as well as one of the best footballers of his generation. Iniesta comes from a small village named Fuentealbilla in the province of Albacete, Castile-La Mancha. At the age of 12, while playing for Albacete Balompié in a junior seven-a-side tournament in Albacete, he attracted the attention of scouts from many clubs around Spain. His parents knew the FC Barcelona youth team coach, Enrique Orizaola, and he persuaded them to consider sending Iniesta to the Barcelona youth academy. 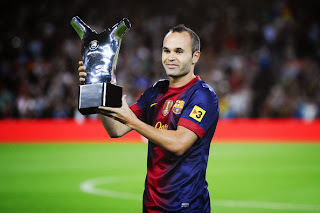 Iniesta burst on to the international scene in 2001, helping Spain win the UEFA European Under-16 Championship, and was in the squad that claimed the UEFA European Under-19 Championship the following year. Since then, he became a regular choice for the then youth coach Juan Santisteban. In 2003 he formed part of the Spanish side that reached the FIFA World Youth Championship final in the United Arab Emirates, and was named in the FIFA all-star team. Since 2008, Iniesta has dated Anna Ortiz, and in September 2010 he confirmed that she was pregnant with his child. On 3 April 2011 she gave birth to their daughter Valeria. The couple married on 8 July 2012. On 27 October 2013, he confirmed that Anna is pregnant with a baby boy. Iniesta has a majority share at his boyhood club Albacete after injecting €420,000 into the cash-trapped club in 2011, with his father José Antonio appointed on the board of directors.